Emma qualified whist serving in the Royal Air Force where she met her husband who was in the army. After getting married they had two boys and decided to settle in Inverness in 2009. 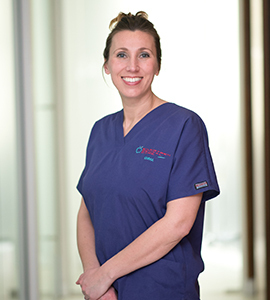 Emma has lots of experience in private practice with treatment of gum disease and cleaning around implants. She regularly attends continuing professional development courses to keep up with the latest techniques and best practice. When not studying Emma enjoys travelling around in the family trailer tent with her husband Steve, their boys and cocker spaniel.